Why do you write? I write because writing is a compulsion. When I am writing the birds are singing, the days are bright, I feel light and floaty. When I’m not writing life is grey and so am I. It is my outlet and my saviour. I always feel like I’ve got my characters with me, keeping me company and I’m never alone or lonely. What would you be doing if you weren’t a writer? I am a high school teacher by day and write at 6 am and on school holidays, so if I wasn’t a writer I’d be doing exactly the same thing and loving it. I’m very lucky that I love my day job and working with young people. What was your toughest obstacle to becoming published? The fact that I felt like there weren’t any books that represented my background and story made me feel inadequate. I didn’t think anyone would be interested in reading a book about a girl from the Western suburbs of Melbourne, about being Bosnian and from a Muslim background, and about having a mother who suffered from Bi Polar. How involved have you been in the development of your book? Did you have input into the cover? I have been so happy with the development of the book and the covers that were proposed. There wasn’t really any cover I didn’t like. In fact I liked too many of them and struggled to decide. In the end I used my students as my market research team and showed them the covers and asked them which one I should go with. They picked the one that I had initially thought was the one, then I got confused by asking too many people. So in the end I have my students to thank, and of course the amazing cover designer at Transit Lounge. What’s the best aspect of your writing life? When the words flow and I feel like my characters and world are coming to life. —the worst? All the time spent throwing words down like stones on a road until the flow starts. What would you do differently if you were starting out now as a writer? I wouldn’t have spent years attempting to work on a sequel to my debut novel, as opposed to forging a new path and trusting that I had new stories and characters to write about. What do you wish you’d been told before you set out to become an author? Write what your heart feels, not what you think will lead to commercial success. You can’t control what will happen once or if your book is published. All you can do is focus on writing the story that means the most to you so you don’t regret the time you spent writing. What’s the best advice you were ever given? First comes the draft, then comes the craft. Which basically equates to get something down so you can polish it into something readable. What’s your top tip for aspiring authors? Read, read, read. Write, write, write. Submit, submit, submit. Repeat. How important is social media to you as an author? This is a really interesting question. We spend so much time on social media and so it feels important, and I know that I have bought and read a lot of books because of social media, but then I also sometimes wonder if it IS a good use of my time, and whether time spent equates to books sold. That’s why I only post on social media things that I feel I want to share. I don’t want to think about it as curating myself or selling myself. Do you experience ‘writer’s block’ and if so, how do you overcome it? Usually writer’s block for me is fatigue and an inability to create. I don’t usually have any time when I don’t have ideas – because I work full time my struggle is to find time to write so ideas are always percolating. When I’m feeling fatigued and spent I take a time out and read books back to back. This gets me back to why I write in the first place – my love of stories and the escapism and joy they bring. How do you deal with rejection? With difficulty. It is very hard to be graceful in the face of rejection – which is why it’s important to avoid social media at these times. I usually have to retreat from life, figuratively lick my wounds, get my gumption back and submit again. The most important thing about rejection is being able to rebound back. My memoir was rejected by five publishers. I took a few months off, revised it again, conducted research about where to submit and submitted to another five publishers. I received immediate interest from the next five, and as soon as I got an offer I withdrew from the rest. I call this the scatter-gun approach. You keep shooting until it hits a target. In three words, how would you describe your writing? Raw, gritty, confessional. If you had the chance to spend an hour with any writer of your choice, living or dead, who would it be and what would you most like them to tell you about living a writing life? I would love to meet Sylvia Plath. She is a poet and the author of The Bell Jar, one of the books I read as a young teenager that resonated so much with me as it was inspired by her own bouts of clinical depression until her suicide at age 30. I would like to ask her about which events in the book were autobiographical. At 16 Amra ends up in the school counsellor’s office for wagging school. She finally learns the name for the malady that has dogged her mother and affected her own life: bipolar disorder. Amra becomes her mother’s confidante and learns the extraordinary story of her life: when she was 15 years old Fatima visited family friends only to find herself in an arranged marriage. At 16 she was a migrant, a mother, and mental patient. Surprisingly funny, Things Nobody Knows But Me is a tender portrait of family and migration, beautifully told. It captures a wonderful sense of bi-cultural place and life as it weaves between St Albans in suburban Australia and Bosanska Gradiška in Bosnia. Ultimately it is the heartrending story of a mother and daughter bond fractured and forged by illness and experience. Fatima emerges as a remarkable but wounded woman who learns that her daughter really loves her. Melissa’s top tip for authors: Finish things and submit them. Why do you write? Writing is a creative outlet for me. I used to love writing when I was a child, but then I gave up for many years as I pursued an education and a career as a scientist. My husband is a musician and a visual artist and I was always jealous of his creative pursuits. When I was in my early 30s I’d had my first child and some health problems that made me reassess my priorities. I took the opportunity to do something I had always wanted to do. I completed a short evening course in creative writing. At first my writing was mostly memoir and realism and was a therapeutic exercise that helped me work through the events of a difficult couple of years. Then one day I’d had enough of that and started writing fantasy and science fiction and began having a lot more fun. What would you be doing if you weren’t a writer? I began a Masters in Human Nutrition a few years ago, but it cut into my writing time too much and I exited with a certificate. If I wasn’t writing I would probably be trying to make a go of a career in nutrition. What was your toughest obstacle to becoming published? There’s a lot of luck involved with getting published. The industry is so subjective. I think you just need to keep honing your craft and putting yourself out there until your work gets in the hands of the right person. How involved have you been in the development of your book? Did you have input into the cover? 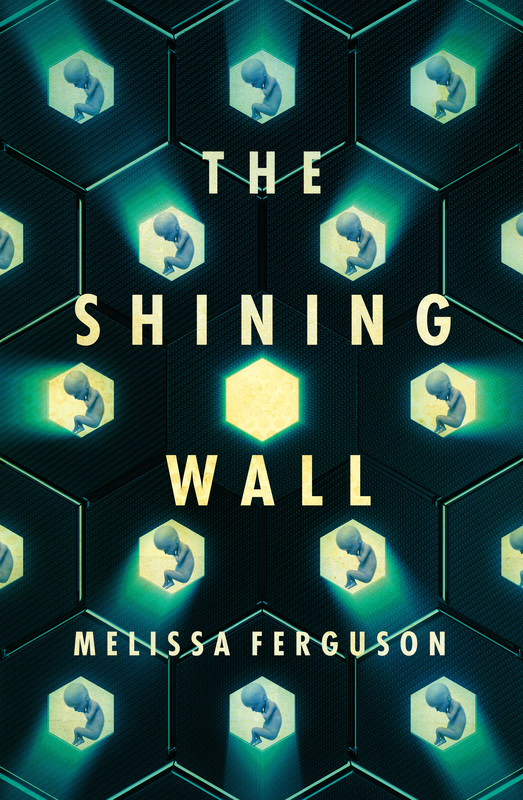 Josh at Design by Committee came up with the cover for The Shining Wall. 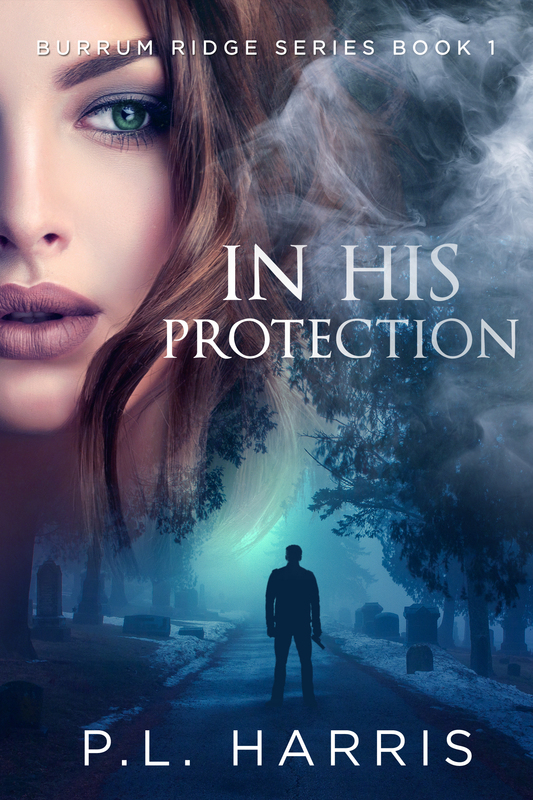 It was the first one the publisher showed me and I found it immediately visually stunning, but I wasn’t sure it fit the themes of the story completely. After a couple of tweaks I was more satisfied with the cover and we went with it. What’s the best aspect of your writing life? The best aspect of my writing life is when someone genuinely enjoys a story I’ve written. You can’t beat that feeling. —the worst? The sore neck and shoulders from being hunched over a keyboard so often. What would you do differently if you were starting out now as a writer? I would have started earlier and not waited until I was in my thirties to take up writing again. What do you wish you’d been told before you set out to become an author? To go with my instincts when something doesn’t feel right. What’s the best advice you were ever given? To finish things and submit them. How important is social media to you as an author? Social media has been great for me for networking with other authors and publishing professionals and expanding my writing community. I can be quite shy in real life situations, so I get a lot more value out of my interactions in cyberspace. Do you experience ‘writer’s block’ and if so, how do you overcome it? For me writer’s block often means that there’s a problem with my story that I need to think about for a while. While I’m waiting for the breakthrough (which often arrives while I’m in the shower) I work on other writing related tasks, such as proofreading, researching, or critiquing for other people. How do you deal with rejection? A few mumbled swears and then I consider any feedback (if I’m lucky enough to have been given any) and decide if I need to do some rewriting or simply keep submitting. If you had the chance to spend an hour with any writer of your choice, living or dead, who would it be and what would you most like them to tell you about living a writing life? I’d would have loved to have met Octavia Butler and told her how much her work has influenced me. Kelly’s top tip for writers: Dig deep and leverage willpower. It’s the ultimate superpower to ensure you never give up. 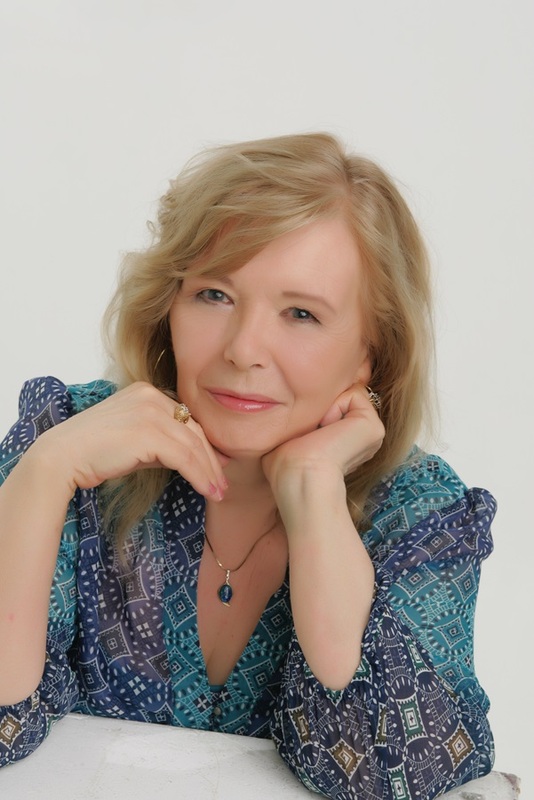 Kelly Van Nelson is a fiction author who lived in the UK and South Africa before immigrating to Australia. 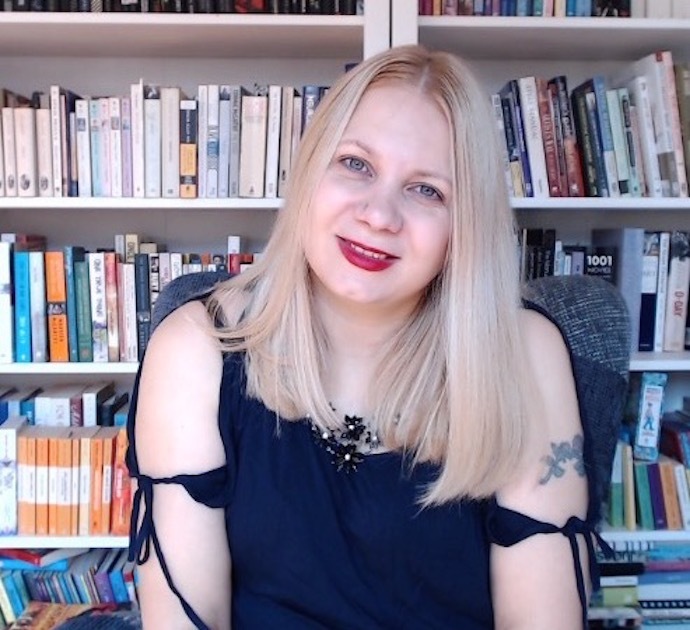 She has had multiple poetry and short stories featured in publications in the UK, USA, and Australia (Serenity Press, Short Story Society, United Press, Between These Shores Books, Fiction War Magazine, Wolvesburrow Productions, KSP Writefree Women’s Writing Group). She is represented by Clive Newman at The Newman Agency. Graffiti Lane is her powerful debut poetry collection. 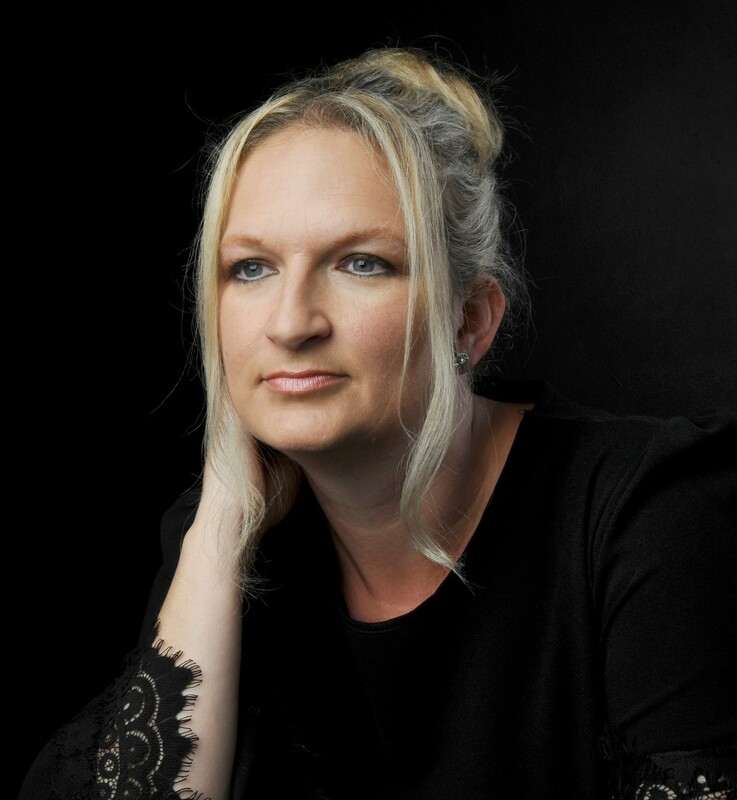 As well as success as a poet, Kelly has also received multiple accolades for her manuscript, The Pinstripe Prisoner, which placed third in the Yeovil Literary Prize, shortlisted in the Wales PENfro first chapter competition, and longlisted in the Exeter Novel Prize. 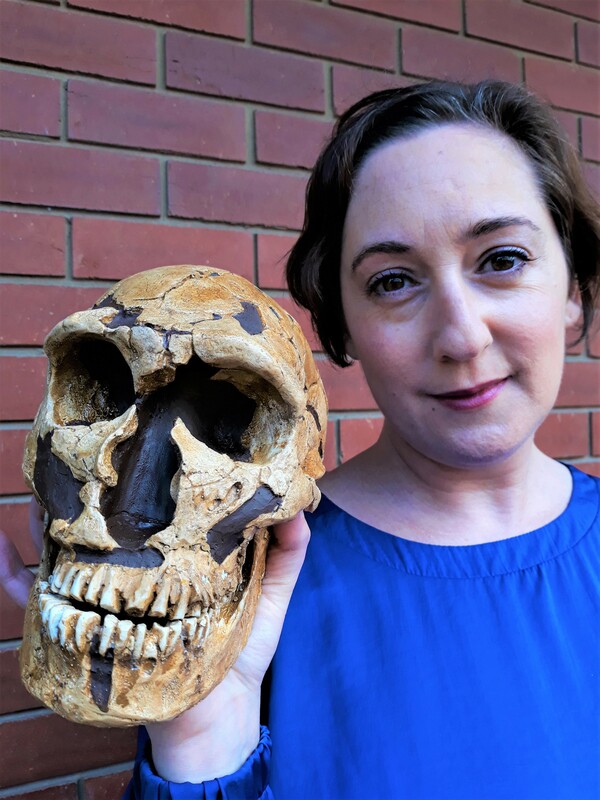 In December 2018 she was awarded a First Edition Fellowship through Katharine Susannah Pritchard Writers’ Centre. The fellowship is part of an emerging writer pilot program, funded by the Western Australian Department of Local Government, Sports and Cultural Industries and Lotterywest. Kelly is also the mum of two children, wife of her soulmate of more than two decades and the Managing Director on the executive board of a global staffing organisation. In short, she is a juggler. Why do you write? I was born in Newcastle-Upon-Tyne in the North East of England (I’m a Geordie) and lived in a council estate in an inner-city concrete jungle. I didn’t have a great relationship with my mother and my father passed away in his forties. It was pretty bleak. My outlet was reading. I read endlessly under the duvet with a torch until the early hours. Enid Blyton and everything else I could get my hands on. At a very young age, I knew I wanted to be a writer – I loved books and the escape that they brought from reality. Now, in my adult years, I find writing the ultimate stress buster. I mostly write late at night, just before I go to bed. It helps me unwind from whatever crazy day I’ve had. What would you be doing if you weren’t a writer? Hmm, I have a full-time day job already; one that I love. I’m the Managing Director for a global organisation, helping people find employment every day and shaping the future of work. If I didn’t write, I would still be working full-time, but I’d probably be going to bed a bit earlier! What was your toughest obstacle to becoming published? There were so many stumbles along the way. Not having a good writers’ support network early in the journey would be one of the biggest setbacks. I used to overwrite a lot, had no formal writing training, and didn’t have a great grasp of the intense editing process that is required to rewrite, prune, polish … then do it all again. It was only when I moved to Australia that I found an amazing writing community who helped me develop into a writer strong enough in my craft to make it into print. How involved have you been in the development of your book? Did you have input into the cover? Ahhhh, the cover. I had an enormous amount of input on that particular aspect of the book. I had a vision in my mind of what the cover would look like, then embarked on a photo shoot in Melbourne’s Hosier Lane to get the perfect shot. Almost a thousand photographs of street art were taken to get the frame that is now the cover of Graffiti Lane. The shot was chosen by my incredibly talented cover designer @thomaspaulartistry. Tom layered the photo with incredible graphics and captured the essence of my gritty author brand and the context of the book beautifully. It looks nothing like what I originally envisaged. It’s way better! 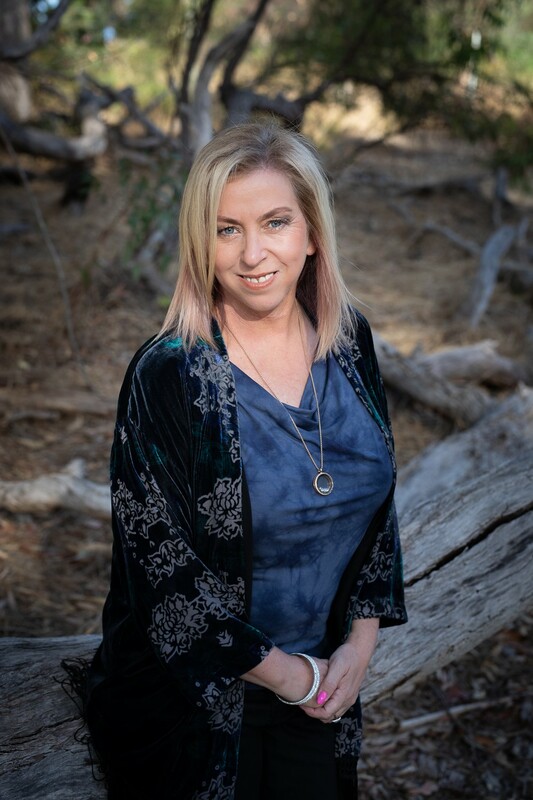 The rest of the book development, manuscript content aside, was managed by my amazing publisher, Karen Mc Dermott, although she gave me wonderful creative liberty with many decisions along the way. What’s the best aspect of your writing life? Touching readers emotionally with something I created is an amazing feeling. If just one reader gets something positive out of words I have written, magic has been realised. —the worst? My hands regularly ache. I use the laptop all day long for work and continue into the wee hours typing at fast speed. It’s bliss rubbing hand cream into them to try and ease the joints. What would you do differently if you were starting out now as a writer? Join a writers’ group immediately. I found mine at Katharine Susannah Pritchard Writers’ Centre (KSP) in Perth only a year ago and it changed my world. Hanging out with like-minded writers is the best for learning all kinds of new tricks of the trade. What do you wish you’d been told before you set out to become an author? Your time will come, but only when you are ready. Every rejection in between is a stepping stone to learn and refine your skills. What’s the best advice you were ever given? Don’t ever submit your work without editing it end-to-end at least six times. I never break this rule now, even for a tiny Haiku poem, and my submission success rate has shot through the roof as a result. How important is social media to you as an author? Social media is a huge part of my writing world. I use four platforms; Facebook, Twitter, LinkedIn, and Instagram, for varied content and to reach different audiences. I met many fellow authors, publishers, and other industry contacts through social networking and the time I spend online pays off ten-fold. Graffiti Lane shot to #1 on Amazon Hot New Releases and #2 Poetry Bestsellers on pre-sales alone, simply from reaching out to contacts online about my book launch. I’m also fairly disciplined about how long I spend reviewing content of friends and posting rather than just idly browsing random content. There is a downside though. My social media platform has evolved into almost 100,000 connections and I dread just one person slamming me – I need to develop a much thicker skin so anything like this doesn’t bother me. Do you experience ‘writer’s block’ and if so, how do you overcome it? Not really. If I sit down to write, I write. It’s often not what I intended to write during the session, but something always pops out. It’s common for me to sit down to work on a novel and churn out a couple of poems or a short story instead. I cut myself a break. As long as I’m getting words out of my head and down on a page, I figure it’s okay. The pressure is not so intense on myself as a result. How do you deal with rejection? I used to get hung up on it, reading the piece again, unpicking the rejection note, then wallowing in self-doubt. Now I keep a spreadsheet of all submissions, track long lists, short lists, successes and failures. The percentage of accepted pieces has been rising month on month so this trend line fights off any negative thinking. When it’s a particularly disappointing rejection (I recently had my novel at final stages with the director of a major publishing house and it fell over), I give myself 24 hours’ reprieve before getting back on the horse and galloping to work again. In three words, how would you describe your writing? Gritty, urban, confronting. If you had the chance to spend an hour with any writer of your choice, living or dead, who would it be and what would you most like them to tell you about living a writing life? Wow. This is the toughest question. There are so many authors I idolise, but one in particular made an impact on my life way back. Years ago, I sat next to Dame Stella Rimington, author and former director of MI5, at dinner. At the time I was struggling with working full time and raising two young children, and was planning a move from Scotland to South Africa. She spoke of how she managed to juggle her career and family life, even talking about an incident where she was trying to get an informer out of Britain while her daughter was sick in hospital. It put my whole world into perspective. I have a signed copy of her book, Open Secrets, with the coolest Bond quote inside. In that one dinner, I learned that a strong woman can succeed through hard work and determination, and mums can have amazing careers too. I would love another hour with her. Graffiti Lane looks at life through an unfiltered lens. With unflinching honesty, Kelly Van Nelson offers an intensely personal perspective on the grittiness of urban living in an eclectic mix of traditional, shadow and free-form poetry. She fearlessly tackles issues of intimidation and discrimination, including playground and corporate bullying, domestic violence, marginalisation, gender inequity, mental health and suicide. 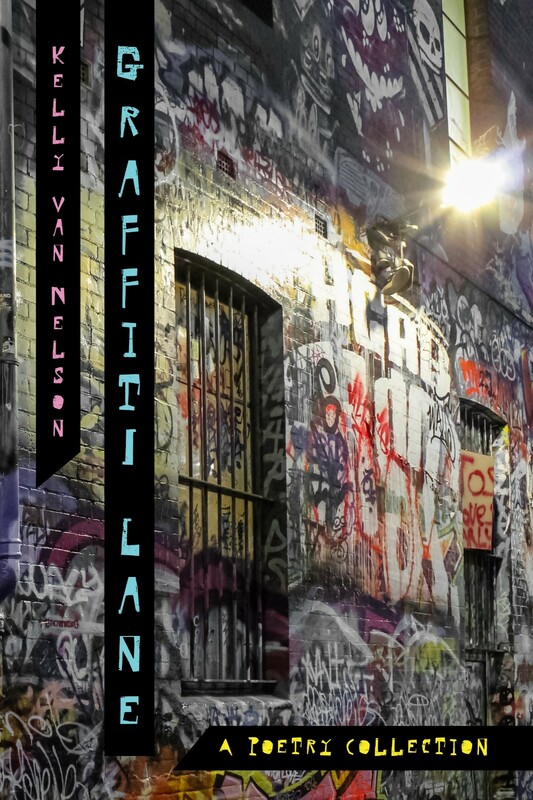 Graffiti Lane is a powerful debut collection of poetry that will stir the spirit and speak to the heart. The book is available from the publisher here. Sonia’s top tip for aspiring authors: Think about what excites you, what inspires you. Write about that. Even if it’s not in now, you never know what will become the next trend. Sonia Bellhouse grew up in England, but she now makes Australia her home. Inspired by Enid Blyton’s comment, ‘One day you might write a book,’ writing is Sonia’s lifelong passion. She has published in magazines both in Australia and the UK and was awarded two major short fiction awards. Sonia completed a university English degree as a mature student. She is a member of Romance Writers of Australia. Her journey to publication is included in the anthology Writing the Dream. She also contributed to the anthology Passages. A longtime member of Armadale Writers’ Group she is their speaker coordinator. Her book Fire & Ice combines her interests in ice dancing, Vikings, love that spans time and Bergen, Norway, a place that she loved when she visited. When not writing Sonia can be found ignoring the ironing in favour of playing with her cats. She reads six to eight books a month and reviews them on her blog https://soniabellhouse.blog. Why do you write? I’ve always scribbled since I was very young, writing and illustrating stories. It is something that won’t go away. I don’t want it to. Writing is a part of my identity. I write to clear my head, to clarify or explore my thoughts. What would you be doing if you weren’t a writer? A lot more reading! What was your toughest obstacle to becoming published? Procrastination and self-doubt. How involved have you been in the development of your book? Did you have input into the cover? Far more involved than most first time authors can expect to be. I have been exceptionally fortunate – a writer friend, who was procrastinating on her own writing , sent me six sample covers. They were all good, but one really spoke to me and I sent to the publishers as an example. After seeking the relevant permission they decided to use it. The editor was one I had worked with before , so I felt very confident in taking her advice, which was comprehensive. There were 13 pages of notes, comments on the manuscript itself and graphs showing character arcs and plot tension points. What’s the best aspect of your writing life? The ability to create what you want, limited only by your own imagination. A close second is no workday commute . —the worst? The usual – the insecurity and self-doubt. The critical voice in your head. The feeling that you should write more, write faster, be more like another author. What would you do differently if you were starting out now as a writer? Start earlier, be brave, send more work out, learn from rejections. Analyse what works, what doesn’t and remember you have a unique writing voice. What do you wish you’d been told before you set out to become an author? That the work hasn’t ended when you have written ‘The End’. in fact, it’s just the beginning of a much larger process. What’s the best advice you were ever given? Believe in your dreams – you were given them for a reason. How important is social media to you as an author? I’ll let you know! I enjoy Facebook and ‘meeting’ authors that I admire. Now I have a Sonia Bellhouse Author page myself. Do you experience ‘writer’s block’ and if so, how do you overcome it? Luckily, I usually have two or three projects on the go at the same time , so if one stalls, I simply switch to another project. How do you deal with rejection? It hurts! I allow myself to experience it – to rage , and to feel they are unjustified. Then when I have calmed down, I assess whether they have a valid point. Did I submit something unsuitable, or to the wrong place? If that’s’ the case, lesson learnt; if not then maybe they had just commissioned something similar. In three words, how would you describe your writing? From my heart. If you had the chance to spend an hour with any writer of your choice, living or dead, who would it be and what would you most like them to tell you about living a writing life? I think this is the toughest question. There are so many wonderful authors I admire and for different reasons. While I have listened to writers at various events and conferences, a one-on-one would give personalised advice. After much deliberation I choose Joanne Harris. I loved her series with Vianne Rocher. It started with Chocolat, continued in The Lollipop Shoes and Peaches for Monsieur Le Cure. The fourth in the series is due for release in April, that is seven years after the last book. What prompted her to revisit it? How difficult was it to return to those characters? I enjoy how the series combines a fey quality of magic with the practicalities of everyday life and well-drawn characters. Each book is different but continues the series. I’d like to learn how extensively she planned it, how difficult it was to get back into the mindset of the characters and whether she would do anything differently. Additionally, she has written other genres, they have a different tone and I admire her versatility. There are even two cook books, some books spanning her French heritage Others on runes and fairy-tales. And we could always talk about our childhoods when we both lived behind a sweet shop. Olympic ice dancer Blaise Daniels’ partner has just called it quits – leaving her with no chance of competing at the Winter Olympics. Determined not to give up on her dream, Blaise travels to Norway to meet legendary skater Kristoffer Erikson. After a bumpy start, they connect both on and off the ice. Their partnership seems assured, but why do they both start having dreams of a mysterious Viking past? Can an ancient love be rekindled or will an old tragedy complicate their present? The book is available from Daisy Lane Publishing, Book Depository and leading online retailers. William’s top tip for aspiring authors: Find the thing that is most important to you to say, and that you are able to say at present. literature, he travelled and worked in a number of different jobs. In addition to reading and writing, his interests include music and education. He has completed a doctorate on the Australian writer Christina Stead, and has had several critical articles on Stead published in literary journals. He is the author of three other novels: Over the Water (2014), The Horses (2015) and The Salamanders (2016). Why do you write? I write to understand. I explore questions that bug me, because something about them does not seem to add up. A story is a form to tease out questions important to me. What would you be doing if you weren’t a writer? Being very unhappy. What was your toughest obstacle to becoming published? Perhaps believing I had a finished work, which I thought worth trying to publish. What’s the best aspect of your writing life? The privilege of being published, and of having a readership, even if it is only small. …the worst? The vulnerability of being published. Once your name is on a public work, you have to wear it. What would you do differently if you were starting out now as a writer? I would have more faith in following my intuition than I had. What do you wish you’d been told before you set out to become an author? I wish I had been more aware of the differences between publishers; there are a lot of publishers, but only some will be a good fit for your work. What’s the best advice you were ever given? Time is a writer’s best friend. How important is social media to you as an author? I’m not very aware of how important it is, as I don’t understand social media well. I don’t have a blog or a website, but I am aware enough to know I probably should. Social media makes me feel socially awkward, which is not a feeling I really want to be reminded of! The email form interests me. I have a few stories composed entirely of emails. Do you experience ‘writer’s block’ and if so, how do you overcome it? If I have nothing to say, which is quite often, I don’t write. I see no reason to push it. So I suppose I simply don’t label a time of not writing as writer’s block. I just see it as a fallow time – or, more likely, a time to research a future work or polish an old one. In other types of writing, such as academic writing, I do experience writer’s block, which in that case is shying away from doing the hard yards, the slog, of getting out an idea. Writing stories should hopefully never be a slog. How do you deal with rejection? I sulk. But then it goads me. I only become more determined to revisit the rejected manuscript and make it better. It’s all part of the game. Every rejection has led to a better work. In three words, how would you describe your writing? It’s just play. If you had a chance to spend an hour with any writer of your choice, living or dead, who would it be and what would you most like them to tell you about living a writing life? Could I divide my time between two writers? Emily Bronte – it would be fascinating to observe how she interacted with the world, to try to get an idea of how she came to understand so much so young. And Jane Austen – she would just be wicked fun. comes to believe advertising uses language too cynically. a warehouse in industrial Mount Druitt, gathering about it others concerned with the misuse of language. with candour Sydney’s watery beauty and suburban harshness. In this new occasional series, illustrators share the stories behind the pictures. 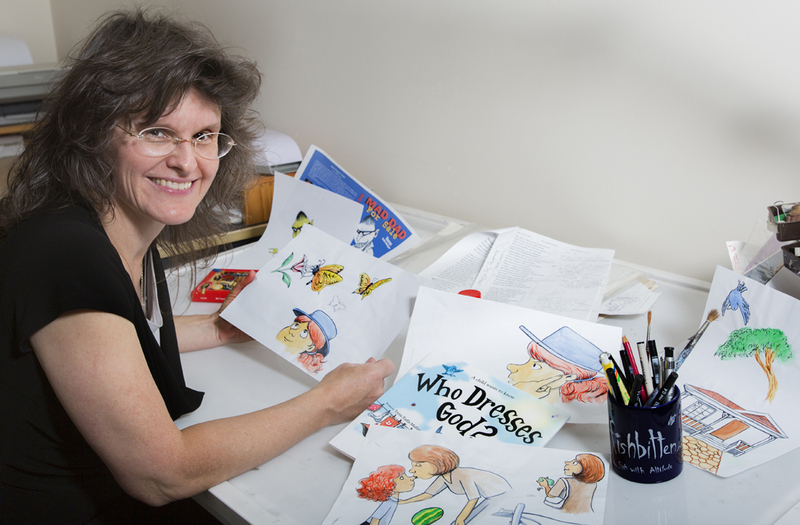 Today, the spotlight is on Veronica Rooke, artist, graphic designer and cartoonist. When Veronica isn’t trying to master baking gluten free muffins or hanging out with her neighbour’s cat, she’s absorbed in her next illustrating project. That could be anything from fire breathing frogs to peeing dogs. After 32 years of drawing, she’s done it all and still loves it. Veronica illustrated Who Dresses God? by Teena Raffa-Mulligan, a sweet picture book about a small girl who also wants to know how He can see, hear and speak without eyes, ears and tongue. 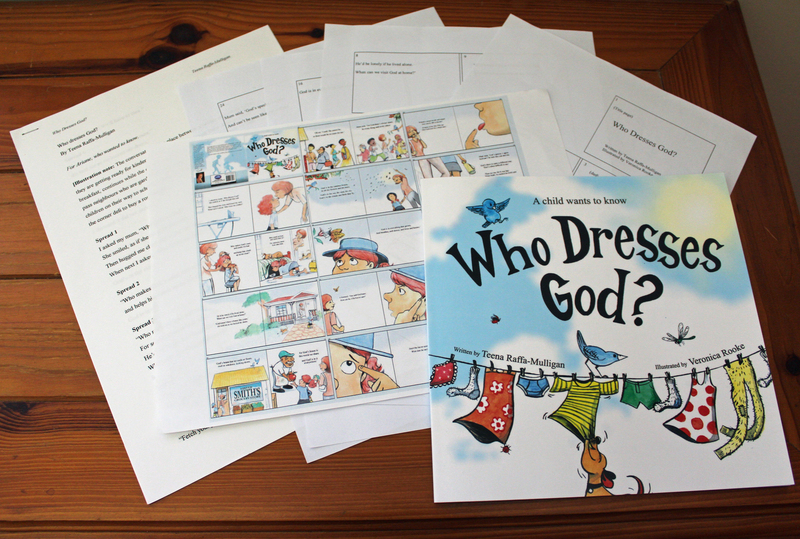 Did illustrating Who Dresses God? present particular challenges because of the nature of the topic? Very much. The art needs to be engaging to people who don’t have faith, while appealing to people who do. How did you approach the project? Walk us through your creative process. Once you came up with some ideas, what was the next step? Firstly I read the story to get it into my head. This helps my mind visualize it while I’m doing ‘domestic’ stuff. When I start drawing, I already know how the pictures will look, so I avoid staring at a blank page. The cover is unusual for a spiritual book for children. What inspired you to use the clothes line and the cheeky dog? I wanted to avoid boring clichés and use visual humour. It’s funny to watch dogs yank clothes that we humans have so carefully pegged up. (I guess funny when it’s not your clothes- Then it’s #@* dog!) And I used word relation: ‘Dress’ in the title and ‘clothes’ on a line. How closely did you work with Teena on the development of the book? I call Teena a ‘dream’ client. She comes into a project with a lovely ‘let’s see what you come up with’ approach. However she knew that with WDG, she wanted a soft, water colour look. The mum in the story took a bit of adjusting to get right, but after that, she ‘let me loose’ on the roughs. Once they were good, I got out my old paintbrushes. How long did it take you to complete the illustrations? They took roughly a few months. As usual, I had to start and stop it because I’m often working on several projects at once. I can’t pick when I’ll get work, so I juggle them depending on which has the closest deadline. Do you have a favourite medium? Not really, I work in all sorts. I find the paintbrush medium for WDG a bit unforgiving. I’d colour the illustrations in bits and pieces and scan them into the computer. Photoshop then allows me to adjust things that a paintbrush can’t. Is there any area of art that you find especially challenging? I’d probably say getting art ‘past’ sales reps and shop owners while working for a t-shirt company. I’d study previous ‘good selling’ designs and felt I could ‘see’ what worked. I’d create something with those elements, but if those two parties didn’t believe me, it would be rejected. However, it was great when I COULD get those designs through and they sold well. Is social media important to your work as an artist? Yes. It lets me showcase artwork. But I don’t advertise current publications very often. A large number of my followers want to be entertained, that’s why most of my posts are cartoons that people are welcome to repost. What are you working on at the moment? 1. I’ve just finished illustrating a picture book for Aly Bannister called ‘Johnny the Leprechaun…breaking school rules!’ 2. Two book covers for Teena called: ‘The Apostrophe Posse’ and ‘Sleepy Socks & Sometime Rhymes’. 3. A range of children’s t-shirt designs for the clothing company ‘From the Bush’. 4. The last 10 books in a 30-book reading program set by Jackal Ed Publications. Your creative life has been diverse and as well as illustrating picture books, you’ve created cartoons for newspapers and magazines, designed T-shirts, giftware, jewellery and logos and presented cartooning workshops for people of all ages. Is there any aspect of being a working artist that you would prefer to concentrate on? It’s easier to say what I DON’T like concentrating on – quoting for jobs. Each project is different, so working out how long you’re going to take is hard. Over quote and the client walks, under quote and you work for peanuts. What is your creative dream? Where I am now. I make a living from drawing in my slippers. Sweet! Don’t get me wrong, I’ve worked in freezing cold to boiling hot factories and in shops. Those times make me appreciate ‘now’ so much more. Veronica’s top tip for aspiring illustrators: Draw…and draw and draw and draw until you become good and fast. Creating books is a business and it’s uneconomical if an artist takes an entire year to create the illustrations! Who Dresses God? is available from Little Kids Business, Amazon and other online retailers. Contact Novella Distribution for trade orders.